Subaru clearly has no intention of following Mitsubishi’s path. The Lancer-based Evolution is being killed off, while sales of its most direct rivals, the Impreza-based WRX and its hi-po STi edition, are booming. Relatively speaking. WRX sales in April are double what they were in April 2012, 79% stronger than they were a year ago. 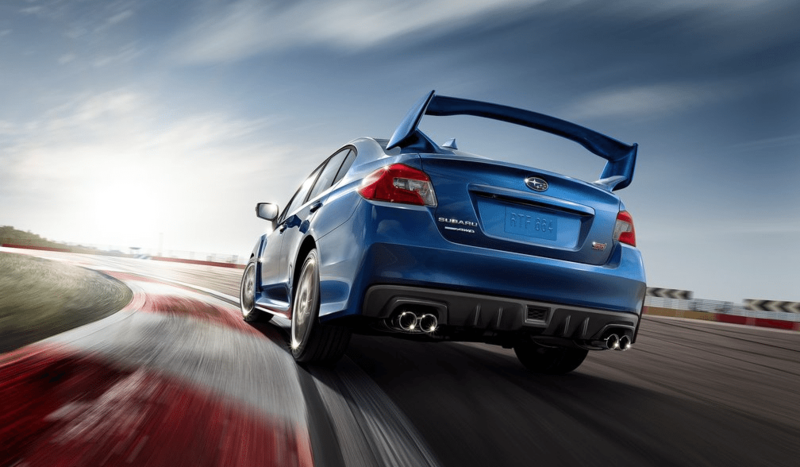 Subaru USA has reported WRX year-over-year sales increases in each of the last 30 months. One out of every three Subaru Imprezas sold in April was a WRX or STi, a strong figure for a serious performance car with a price tag above $26,000. Too many automakers don’t release sales figures for the WRX’s potential rivals, direct and indirect. We have no numbers for the Ford Focus ST, for example, or the aforementioned Evo. You could argue that the WRX’s numbers aren’t high at all, not when Chevrolet can sell more than 3500 copies of a two-seat sports car with a price tag above $53,000. But the Corvette, Camaro, Mustang, and Challenger are unique breeds in the U.S. market. Of course they’re appealing cars, but you won’t find them competing at this level with these kinds of mainstream sales numbers in other markets. Not surprisingly, with the Mustang approaching replacement, the Camaro has seen its market share increase in 2014. In its three-car muscle car group, 42.2% of the segment’s April sales were generated by the Camaro, up from 38.8% a year ago. We have asked Jaguar to confirm the F-Type’s bizarrely low April results, by far the poorest figures since the car arrived last May, but we’ve yet to hear back. You can click any model name in the tables below to find historical monthly and yearly U.S. auto sales data. You can also select a make and model at GCBC’s Sales Stats page. These tables are now sortable, so you can rank sports cars, roadsters, hot hatches, and coupes any which way you like. Suggestions on how GCBC should break down segments can be passed on through the Contact page. Clearly GoodCarBadCar is not suggesting that the cars in the two tables above are all direct competitors. Establishing categories among cars as unique as even the Audi TT and Porsche Boxster has never pleased a single reader, so cars have been lumped together so you can simply see how buyers looking for sports cars, roadsters, hot hatches, convertibles, GTs, and wanna-be sports cars spend their money. Greater categorization of cars would only lead to problems that automakers create by not isolating model-specific sales figures: we don’t know how many M3s BMW has sold or how many Civics are Si models, for example. The numbers we do have are listed above. The BMW 6-Series has been removed from the premium list because we don’t use this space as a showcase for sedans (unless automakers release data for high-end sporting models like the Lexus ISF, as Toyota Canada does) and the 6-Series lineup now relies heavily on a sedan variant. GoodCarBadCar is always open to hearing about the ways you would break down segments, so feel free to get in touch. You can always find the sales results for EVERY vehicle and form your own competitive sets by using the All Vehicle Rankings posts. Sales data for brands such as Aston Martin, Ferrari, Lamborghini, Lotus, Rolls-Royce etc. are unfortunately not broken down by model. 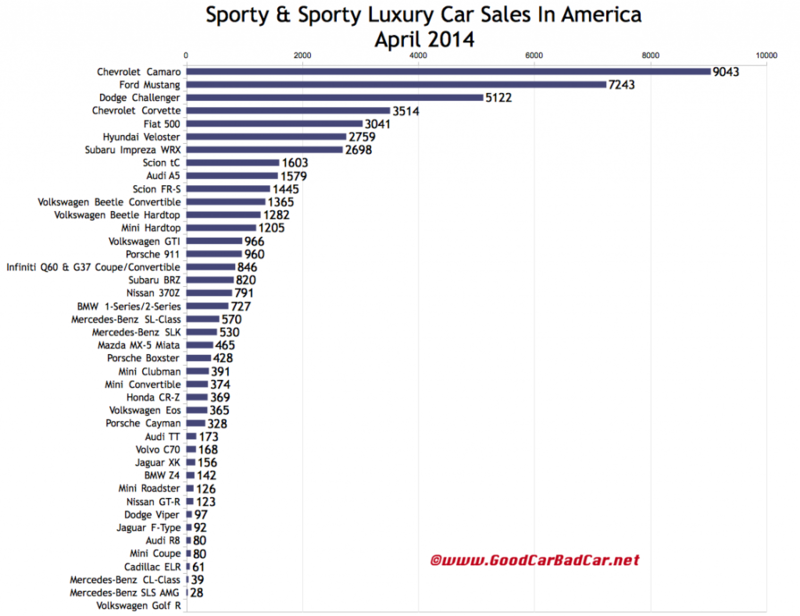 estimates say sales for those brands in April 2014 were 102, 175, 59, 14, and 75, respectively. 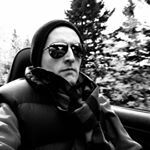 HybridCars.com estimates that Tesla sold 1400 cars in April.